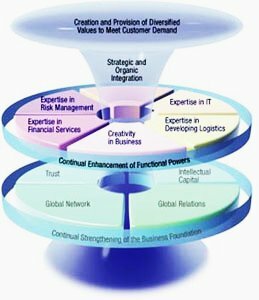 Diverse and Advance Functions: Base on its solid business foundation, PAI will offer the following diverse and advanced functions. We will need to excel in business creation, which involves identifying promising new products, developing new markets, and organizing appropriate business operations. In addition to the ability to provide a wide range of integrated logistic services, we will need to have the capacity to develop and deploy services to match demand and supply of cargoes, trucks, and warehouse space. This includes fee collection/payment, provision of capital, project financing and advanced financing services such as securitization of assets. This involves the ability to build Supply Chain Management (SCM) systems and to support network business.